My Steps are Missing! How to get your steps synced. If it appears the data from your pedometer is not matching your Walker Tracker account, there are several actions you can take. First, check your pedometer's app or log into your pedometer's account online and make sure that steps are synced for the date(s) in question. If not, sync your pedometer to your device's account. 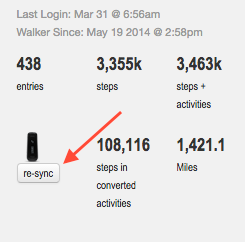 After syncing, return to your Walker Tracker account and click on the re-sync button located below the picture of your device in the right-hand sidebar. Second, if you log into your pedometer's account and the steps are already in your pedometer's account. Return to your Walker Tracker page and click on the re-sync button below the picture of your device in the right-hand sidebar. The re-sync button is great because it pulls in the last 7 days worth of information from your device's account. However, it will not pull in 7 days if you recently registered, recently (re)connected your device or your program just began. In those cases, they will pull in from the date you registered, the date you (re)connected your device or the date the program began. If you have checked all the above and steps are still not brought into your Walker Tracker account, please contact us at support@walkertracker.com.